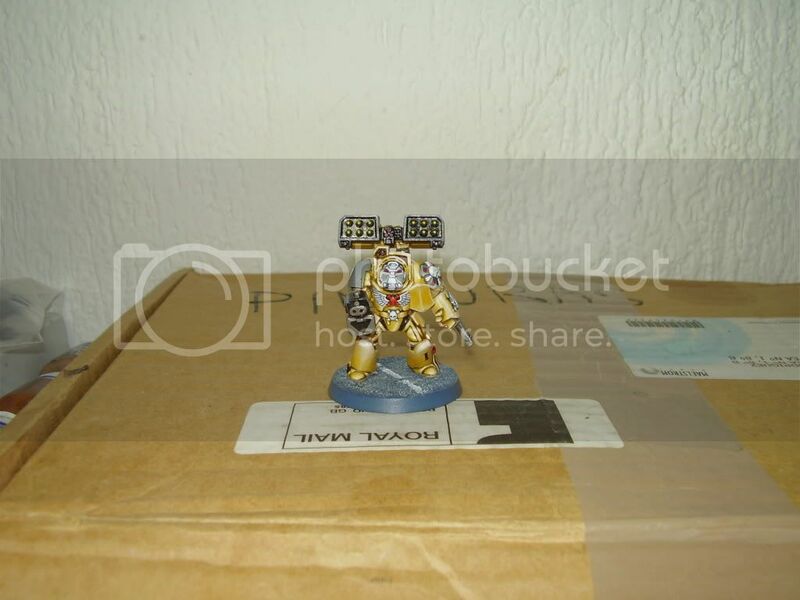 Hi, so ive had an army of space marines for 4 or 5 years. But in all truth i have not played them at all since they released the last 40K edition. That game is too simple imo. But still i still like my armoured troopers. So ive come back to it this week. I finished the sergeant, special and heavy weapon i was missing on my 1st squad in just 2 days and today i hope i can finish another terminator. My chapter is called the autocrats of Terra, ive given them all fancy names of famous Spanish ''conquistadores'' and of the generals who were in Italy and Flandes during the century Spain ruled Europe (and we were hated all around, you know). 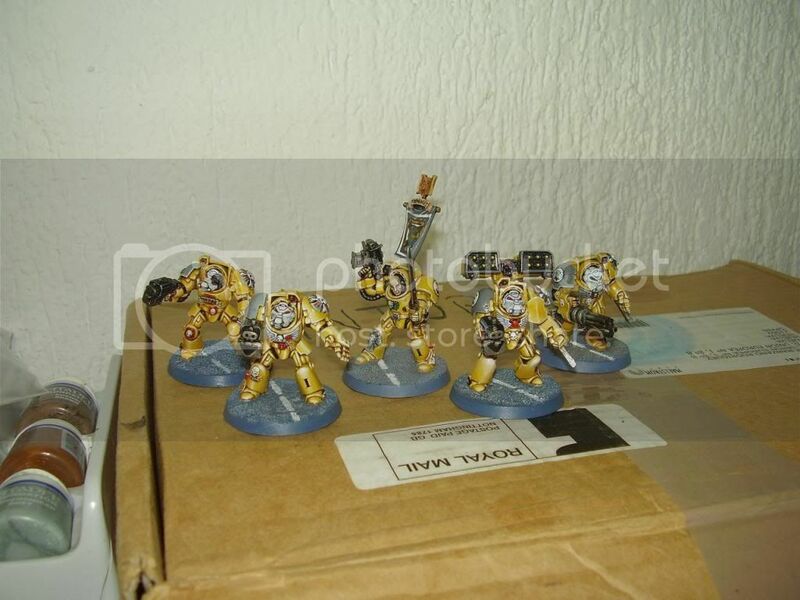 Also, since they are from Terra, they are based on the imperial fists genetical seed. 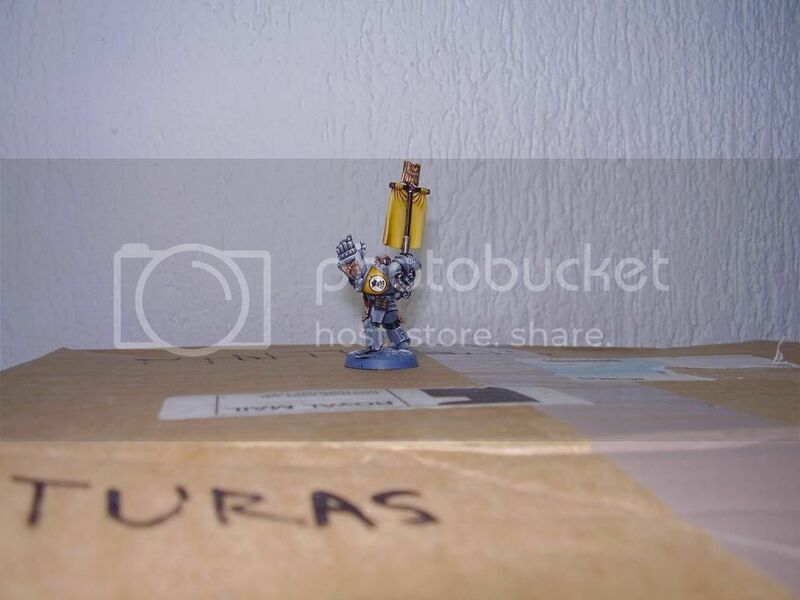 I already have painted some stuff. All of it is around 4 years old but i plan to have painted a 2000 point army in about half a year. 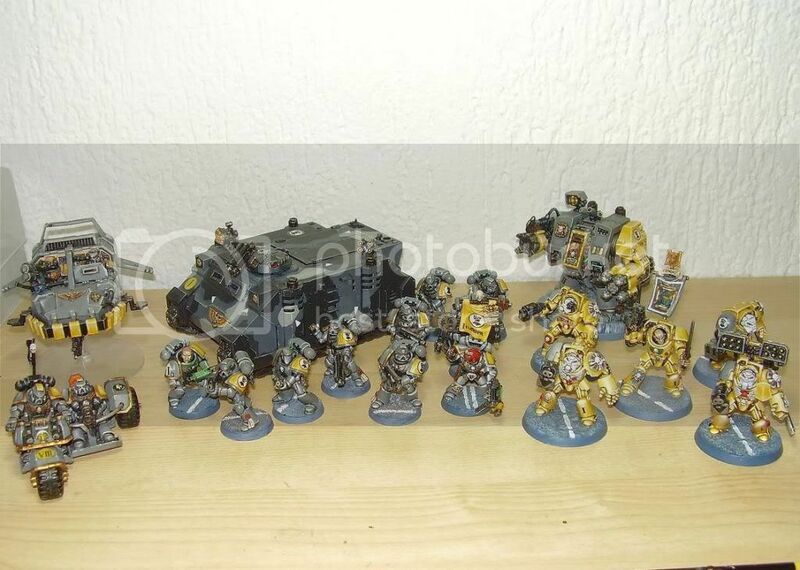 Currently and once i finish the terminators i think i have around 800 points painted. 1st thing i painted, an attack motorbike. 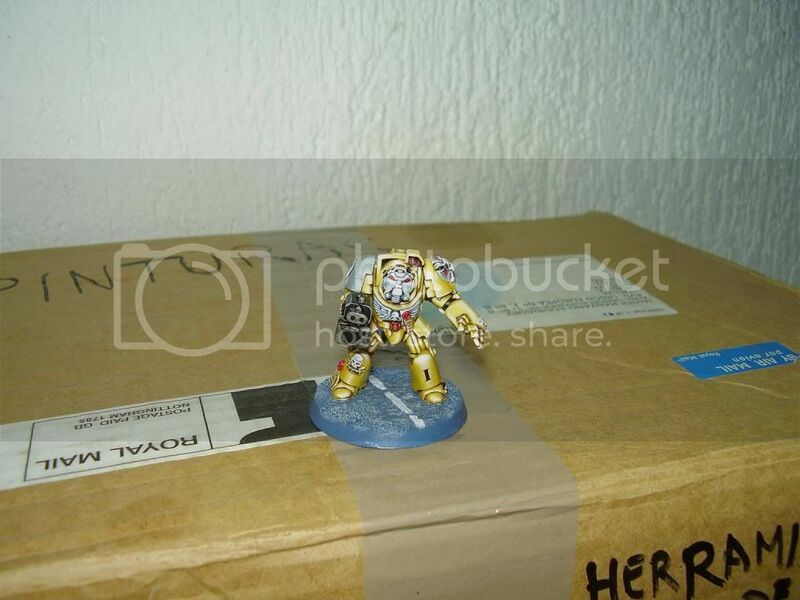 Its missing the meltagun, i painted a heavy bolter but switched it later and still havent finished it. 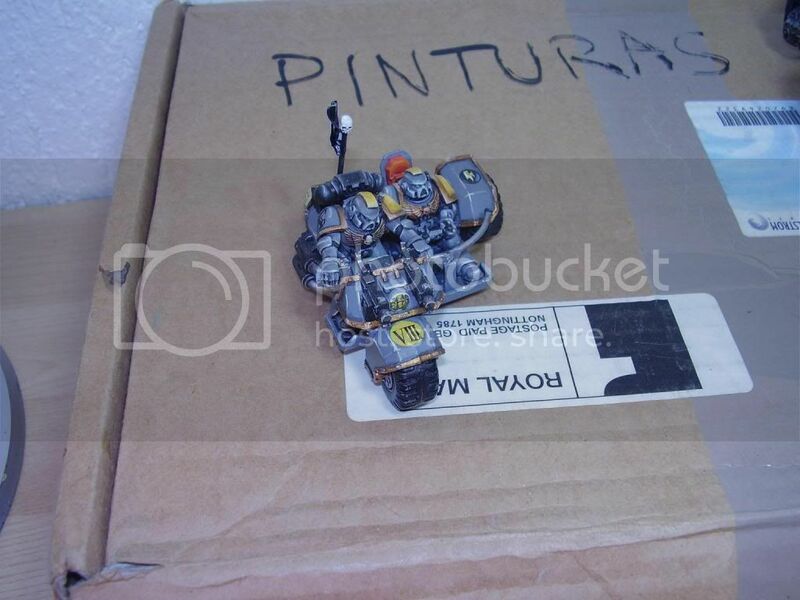 1 Landspeeder with Metalgun and heavy flamer. This one for some reason looks quite nice. 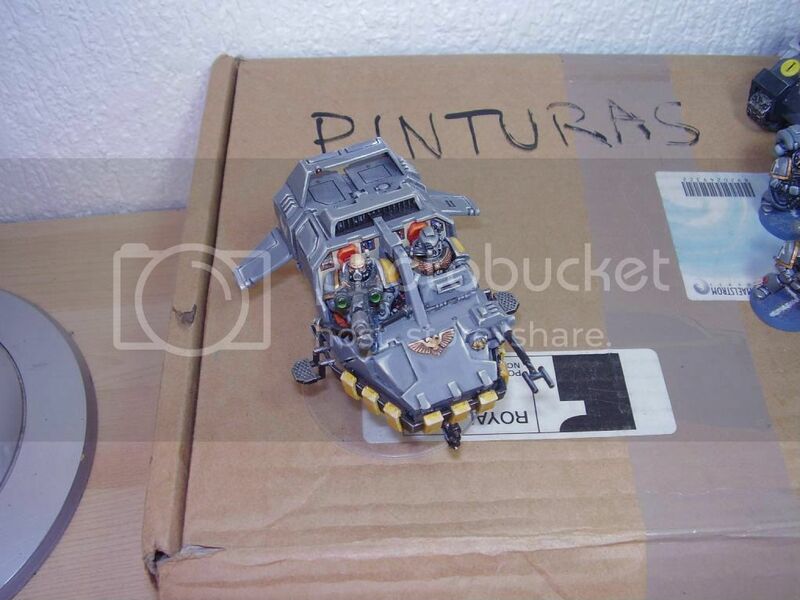 I have to paint another which i will paint the front part like a sharks jaws, i added this other speeder some tyranid stuff so it looks like it has the teeth of the shark on its front. WIll post pics later. Im quite happy with how this one came too. 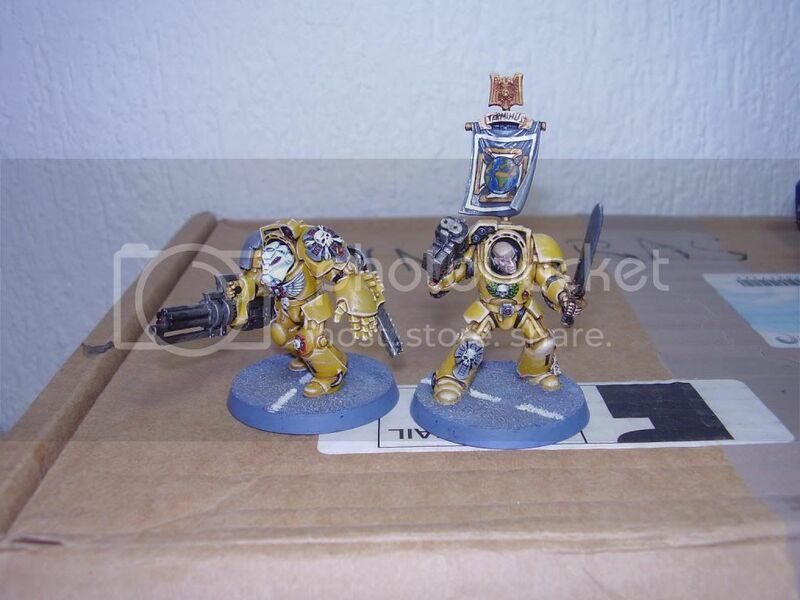 The 2 terminators i have finished. 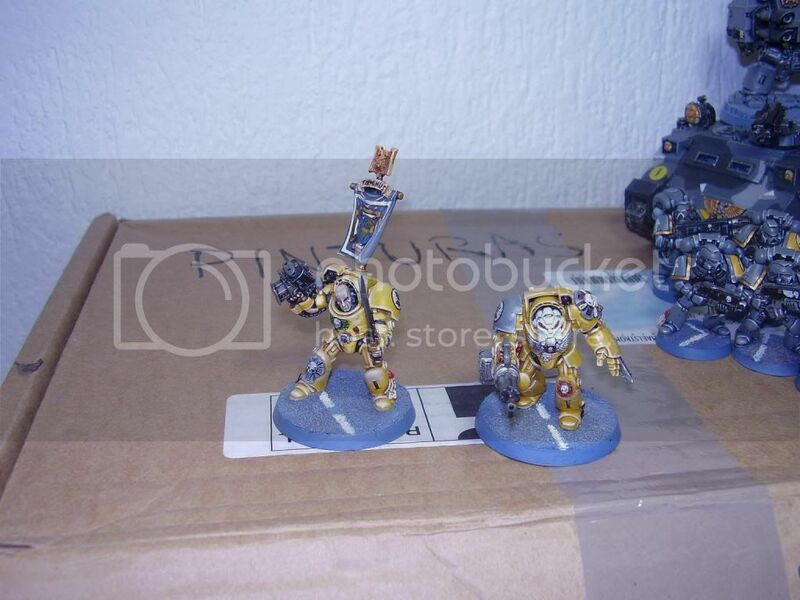 sergeant and assault cannon. Finally the Squad i finished yesterday. 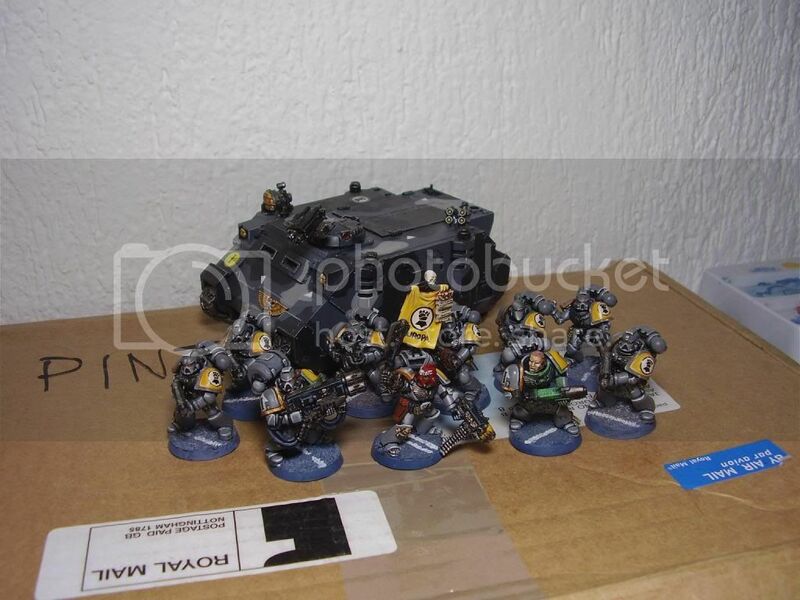 a 10 man squad equipped with melta gun and plasma rifle. 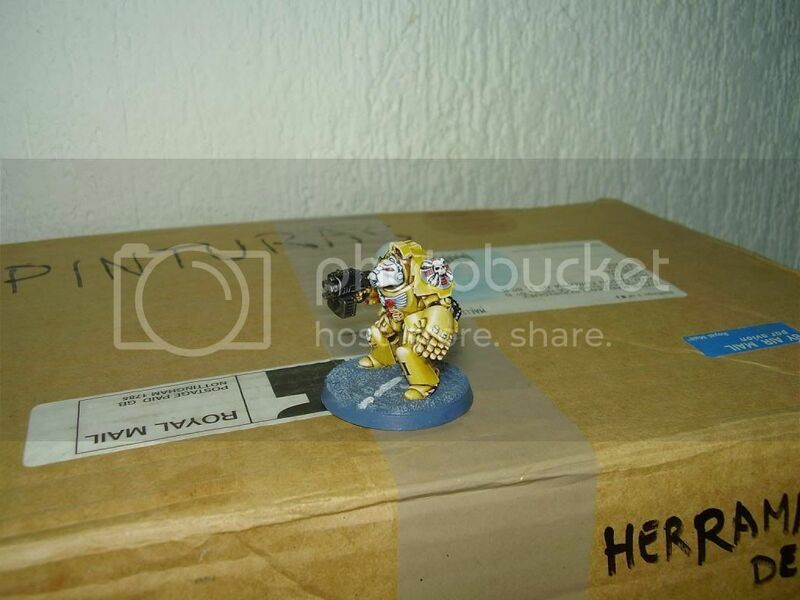 Sergeant is equiped with power weapon and combi bolter-plasma. 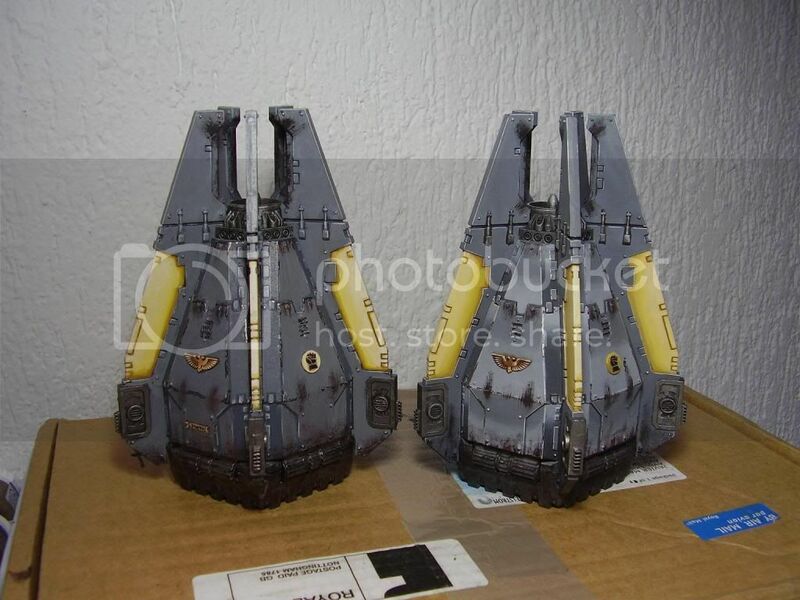 Also did finish their Rhino transport which i painted in urban camo (this is not allowed by the codex astartes, the book which tells you how the space marines should be equiped, fight and dressed, but my chapter is specialled in city fight so ignored the point). Last edited by Mireadur on Fri Apr 27, 2012 7:42 am, edited 12 times in total. 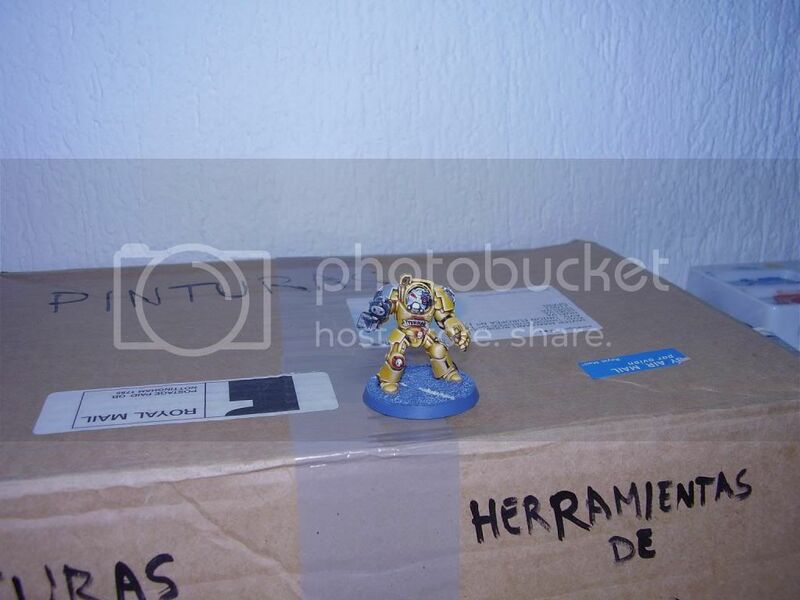 Post subject: Re: Mireadur's Terrae Autocratorum log (A Space Marines log). It must be said this was up for some quite violent debate at the time! Good stuff, nice colour on the Exos! Update. i finished today the 3rd terminator of the terminator squad ''terminus''. Unlike with the 3 tactical marines i painted yesterday, this one went quite fast and specially i went through painting it really smoothly, with no doubt of what part do next or how to do it. Im quite happy with how he turned out too. This is all for the next 15 days. 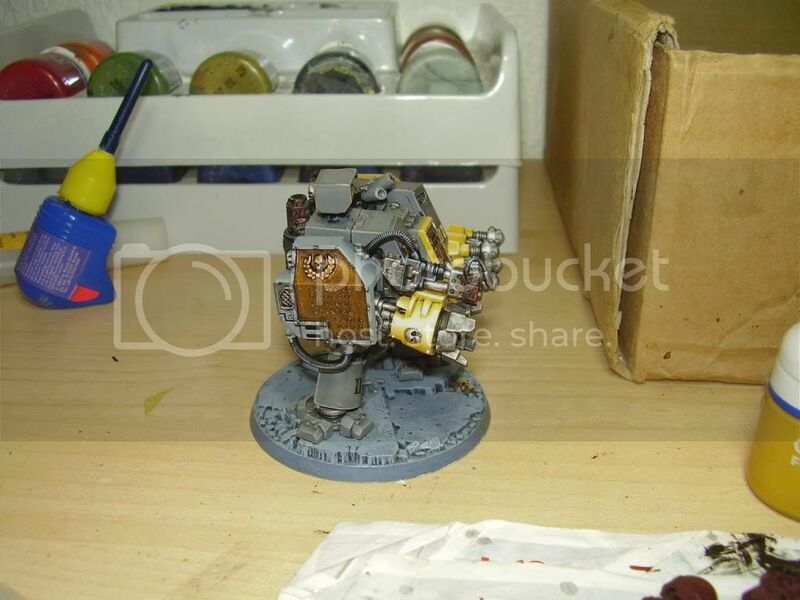 Once im back from the trip i want to finish other 2 terminators and then a tank. Last edited by Mireadur on Sat Mar 17, 2012 11:55 pm, edited 2 times in total. Post subject: Re: Mireadur's Terrae Autocratorum log (terminator update). 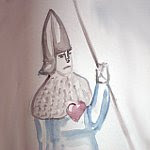 Hmm, maybe I should also add something constuctive to this blog...: I feel that this last model is not your best work. It looks ok, but maybe a bit rushed. It's the details (like the knee-cap) that do this for me I think. 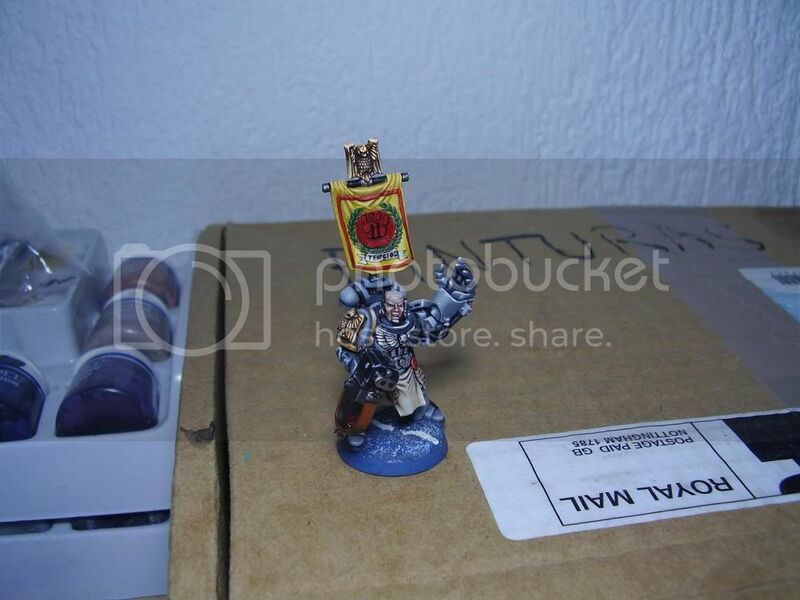 Also, I've seen you do the nmm contrast better. Especially the back, which looks a bit bland. O, and of course: shame on you for moving away from your great elves. These puny humans are not worth your attention. You also lost against a bunch of Dutch peasants in their independance war. It took 80 years though didn't it? I really like the colour there. There's something resonant about it. I like that you painted a profile of the Earth on the Terminator sergeant's banner; it's a nice touch that I'm actually somewhat surprised has escaped comment so far. Hi from vacations place. I find strange you dont like that termie. i feel the yellow turned out very very well. 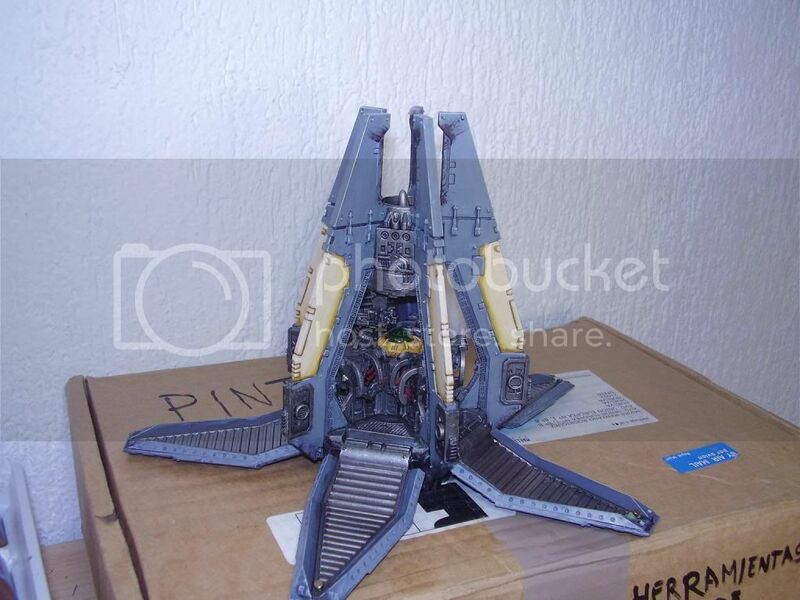 Although it is true that the pic doesnt do justice to the back side of the model. 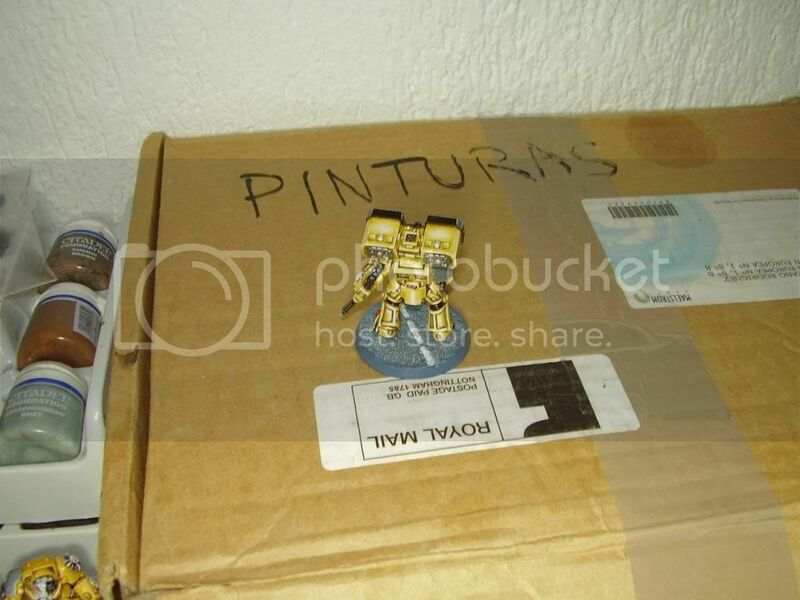 I assure you it is painted carefully . About details like syumbols and skulls you are right though. they are just painted. I focused on the yellow and the... Gem things. My plans for this army however, arent as high as for the HE, but i guess the models will improve as i gain more practice. 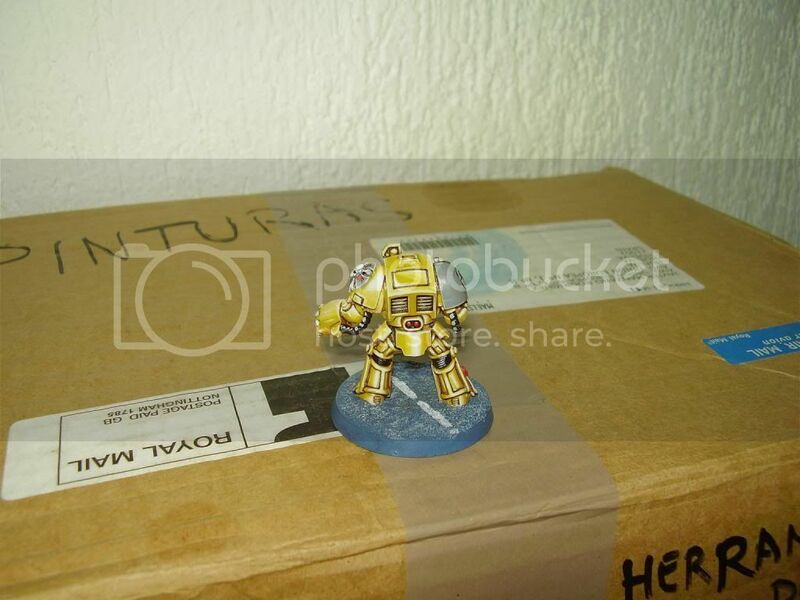 Wow, I'm out of action for a month and you start a 40k army? Tstktsk. Looks good dude. Hi i painted 1 more terminator lately. I spent more time on this one and have to say the armour lights turned out amazing, although pics may be too flashy and cant see it completely well . Anyway here are the pics of him. Now i have to paint 1 more with a missile launcher on his back which i made removable thanks to earth magnets (will show it in detail when i finish the model). Finally a group shot of the 4 termies i got so far. I plan to finish the 5th before march is over and also want to paint Lysander to have a terminator captain for the army. Post subject: Re: Mireadur's Terrae Autocratorum log (terminator 18/03/12). How much wood can a woodchuck chuck??.. It really does look good... I think is my best painted model currently but only because yellow is probably the most gentle colour with blending. 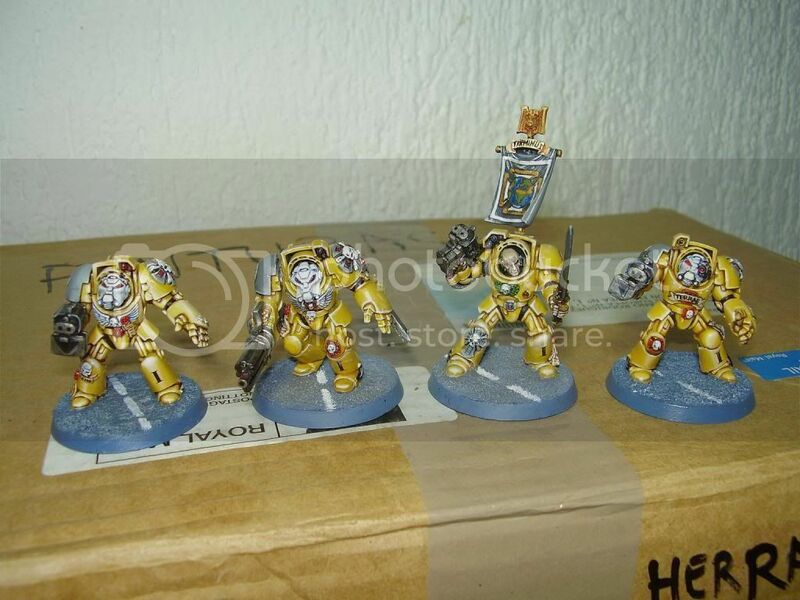 It may be discorageous to start painting in yellow but once you get there it looks really well. 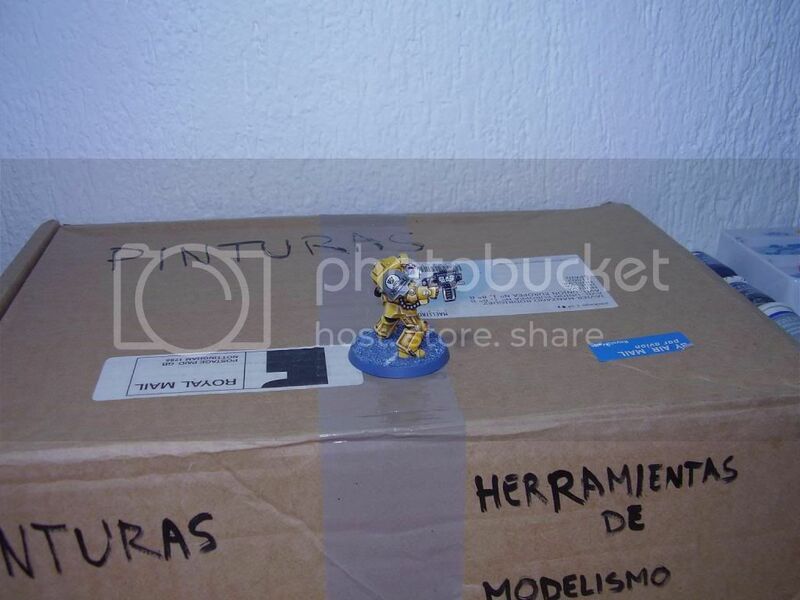 Something strange this, because i think yellow ''per se'' only looks good in miniatures and sports cars hehe. I was really burned out of painting, really tried to continue painting dragon princes but was unable to grab the brush. Fortunately the regional warhammer 40k tournament which is happening on April 29th has given me wings to restart painting... Marines. Well, better than nothing you punks! Dreadnought ironclad arms. I tried a more advanced NMM on this one. I think it looks good although i tend to go for over-saturation instead of shading more... Well.. Saturation is my weakness :/. Last edited by Mireadur on Thu Apr 19, 2012 6:22 pm, edited 1 time in total. 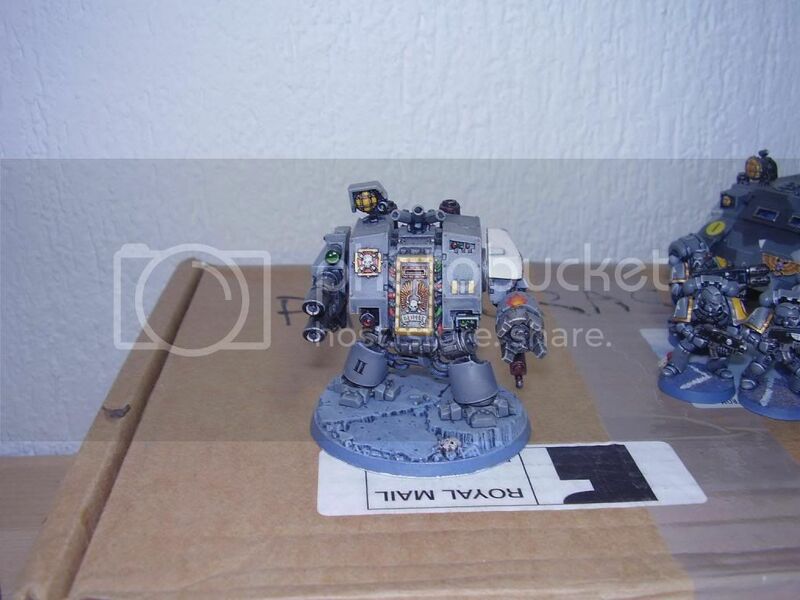 Nice work, the dreadnought looks great, and the army shot is nice. Sensational stuff, love the road bases. Hey guys, im painting a shitload lately, but only doing basic colours and stuff. 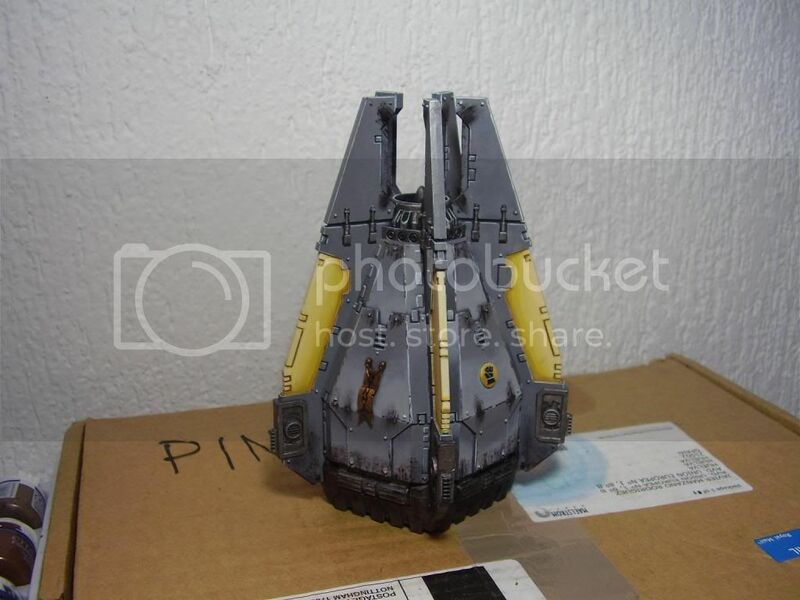 But i felt like finishing this drop pod in between the marathon of army painting for the tourney. 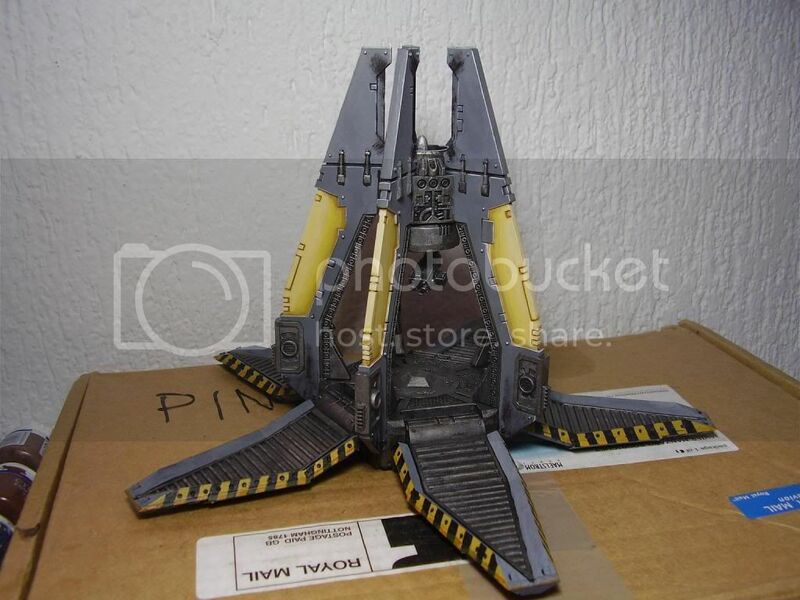 I bought the drop pod in ebay and the guy had applied a really thick layer with something similar to nails paint. It has crazy brush strokes up and down so i took the chance of an already almost impossible to repair model to try some heavy weathering effects. This is very appropiate for a drop pod as they are launched from orbital ships into a planets atmosphere so it is expected they land all burned and scratched. So heres the model, painted in just 10 hours, it is a 180º from my usually more clean style. 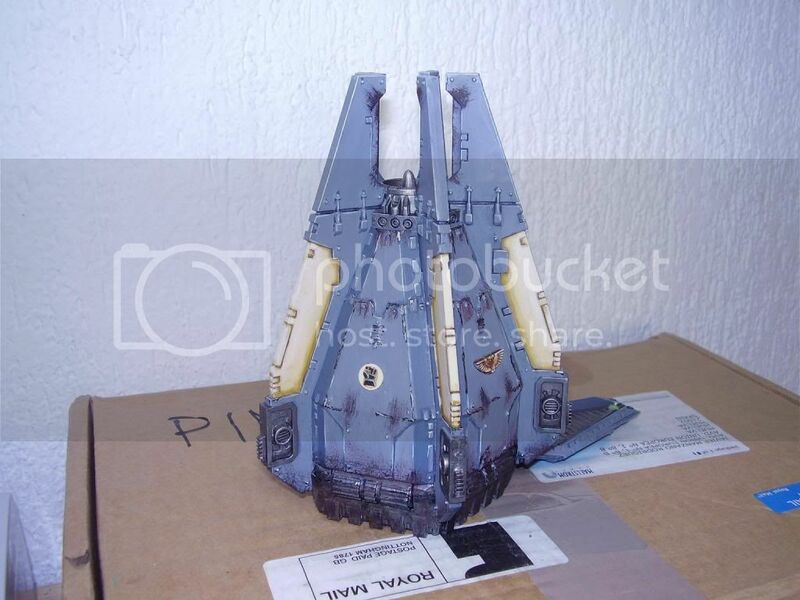 Nice work with the weathering! It's subtle and not over done, so often I've seen well painted vehicles get a little too weathered. 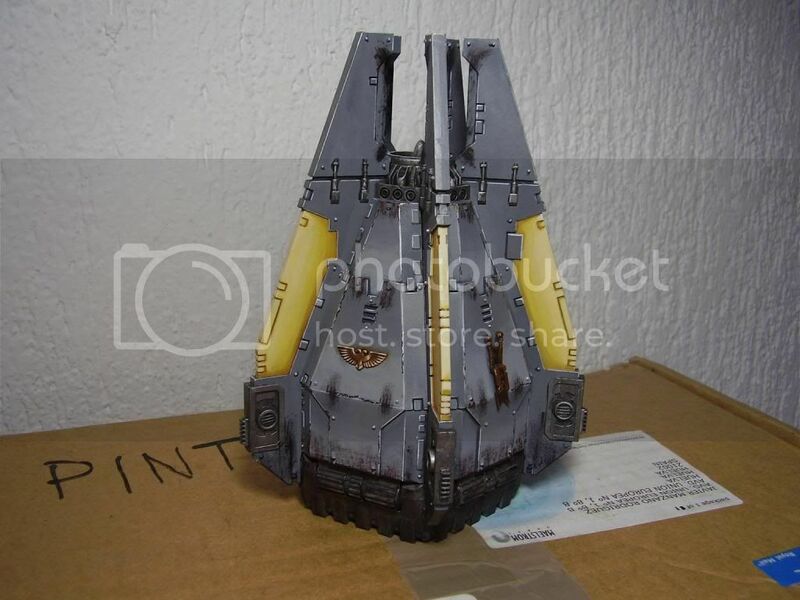 Hey guys, i painted a 2nd drop pod. 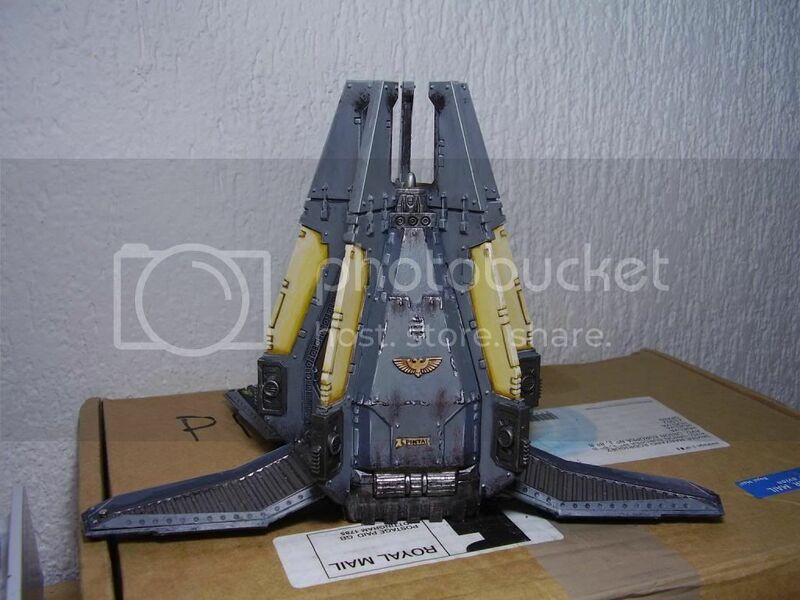 This one took 14 hours instead 10, much more considering i didnt assemble the marines harnesses inside the pod because this one is designed to carry a dreadnought. The reasons for this extra time are that i went for NMM on the doors, which proved incredibly time consuming being 5 doors, and also painted the yellow/black trim pattern on the sides of the open doors. Both of the features have been done somehow ''hastily'', i dont want to imagine how much longer would have taken had i tried to paint the NMM on max quality . agreed. 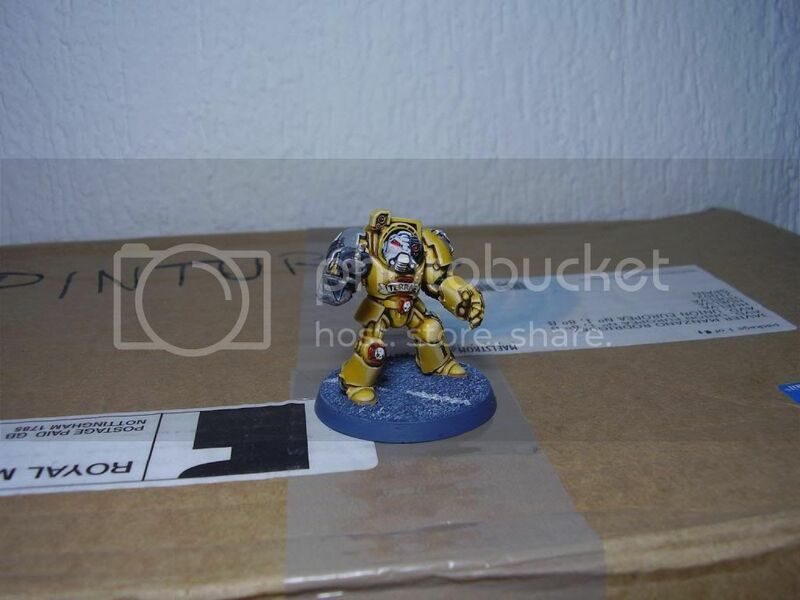 The NMM makes the new one stand out and look more metalic. It's great to see the two of them together and be able to make the comparrison. Thanks for the pics. Thanks for the comments guys. I just finished the model i will be using as Pedro Kantor. 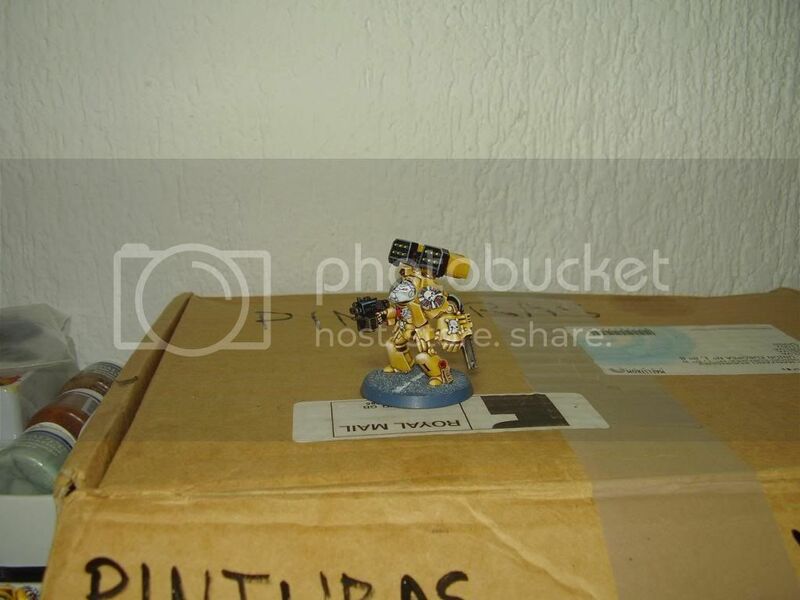 This model is really the BSB of my 2nd company command squad, but since hes geared the same as the special character Pedro Kantor i will be using it for the tournament. It took me somewhere between 5 or 6 hours. The good thing about space marines is that they can be faster to paint than elves and that they allow you to practice blending very well (im learning that blending grey is really difficult, this colour will cover the layers below so much ). Looks great, especially the banner and his face. True about greys. Blue greys are easier to blend than the rest. what recipe do you use for yellow Mireadur? Foundation Yanden darksun--->devlan mud (heavy), correct any part where wash didnt go into recesses with snakeleatherbite---->mix of 1/4 Yanden/white (more or less..Just make it quite white)---->go ahead with pure golden yellow--->then keep adding white to golden yellow until pure white in the sharp edges. 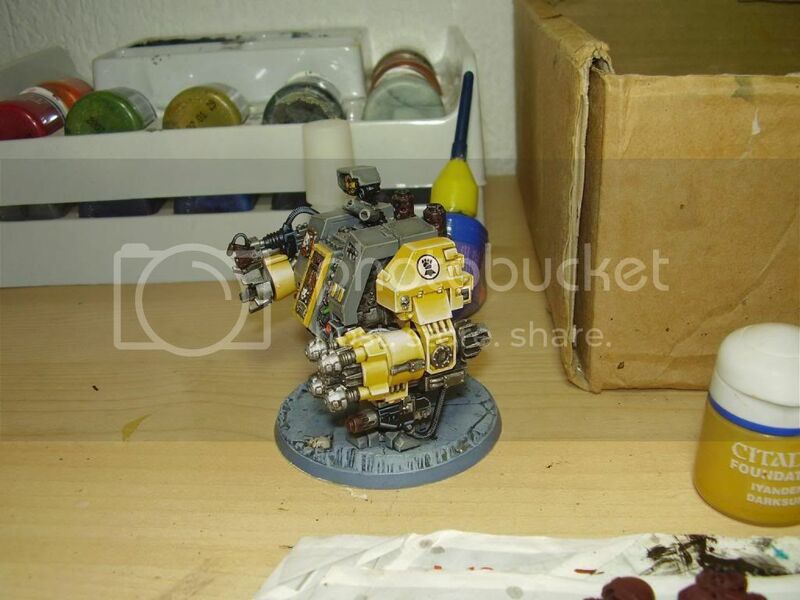 Blending works really well with yellow, can get a very good blending with much less effort than with others colours ive tried, even red. I recommend yellow/white to practice true blending, in fact.